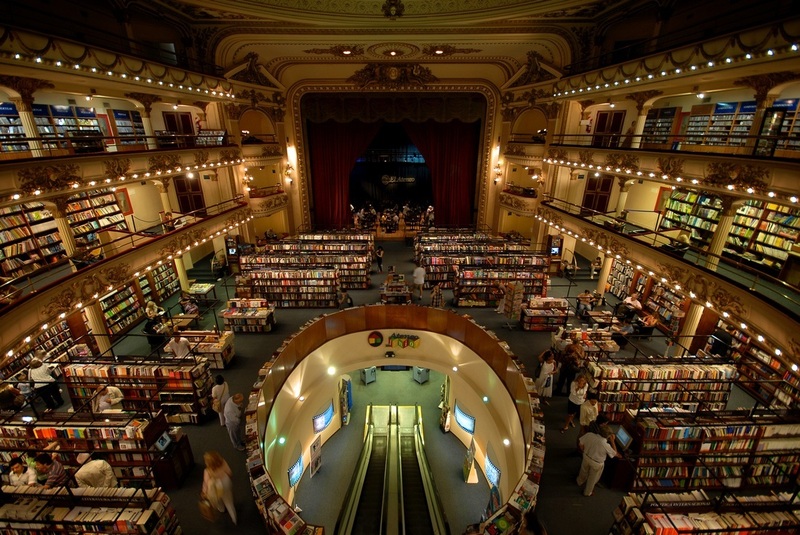 El Ateneo Grand Splendid (or just El Ateneo if you’re on a first-name basis) is that enormous, breathtaking bookstore located on Av. Santa Fe, close to the corner of Riobamba in Recoleta. It is also known as that place you take your newly arrived friends when you want to impress them. The building was opened in 1919 as a theater, back in the days when Buenos Aires was booming as a major port and center of commerce (sigh with #nostalgia). Just to give some context, even Carlos Gardel himself came to El Ateneo to record for the Nacional Odeon label that was installed inside of the theater; he even made his radio debut at Radio Splendid, the station that began transmitting in 1923. There’s a little bit of trivia for you to brag about. You’re welcome. This is not the first time that El Ateneo has been featured in a world class publication. In 2008, it ranked number 2 in The Guardian‘s Top 10 bookstores from around the world, just behind the Selexyz Dominicanen bookstore in the dutch city of Maastricht, and six steps ahead of the only other shop from Latin America, Mexico’s El Péndulo (sorry not sorry, Mexico).